American author Frederick Barthelme whose work is described as Dirty Realism or K-Mart Realism has a reputation for setting books in the New South. There Must Be Some Mistake (and I’ll admit that I was attracted by the book’s cover) is the story of Wallace Webster, a divorced, retired architect. Wallace lives in one of the “prestigious” Forgetful Bay condos in Kemah (“halfway between Houston and Galveston“), Texas and more or less leads the sort of life he wants. His first wife died of cancer, his second wife Diane inherited a sizeable stash from her father and now lives on Rhode Island, and his college age daughter Morgan drifts in and out of his life. Jilly, a former workmate also visits, and with Jilly the relationship is a bit murky. There’s an attraction there, but Jilly is still damaged from her marriage which was “like TV show nasty, true crime nasty” to the ubiquitous Cal, a “tough piece of business.” Neither Jilly nor Wallace seem willing to make a move on the attraction and are happy to keep their relationship as an easy friendship. The book begins by setting the pace of Wallace’s life, and although this is a man who could harbor bitterness towards some of the events in his life (his first wife, a singer died of cancer, he was elbowed out of his business by his partners) Wallace is a very well balanced individual, content to enjoy his life and his free time. We realize that Wallace has an enviable life in many ways–it’s peaceful, bucolic even, and he has the means to do what he chooses. For a few weeks the police were all over the neighborhood like mice. They were asking questions, coming in twos to everyone’s door, inviting themselves in, sitting on the edges of sofas and wing chairs with their little tablets, little flip books where they took notes whether the interviewees knew a thing or not. With the police now frequent visitors to the condo development, Wallace finds himself becoming involved with the mysterious Chantal White, a woman whose murky past isn’t quite as buried as she’d like it to be. Chantal is the owner of a architecturally unique restaurant called Velodrome, and Wallace is just as drawn to Chantal’s restaurant as he is to her. It’s through his relationship with Chantal that Wallace chews over a great deal of his past choices. We got back late and the bar was lit up with floods high on the telephone poles in the lot and I got the midnight view–the building was like a giant rock, made out of that blow-it-on concrete that people make odd-shaped buildings with, except here the shape wasn’t geometric, it was like a boulder the size of a small hay barn, all chiseled planes, small cliffs. irregular flat spots, poorly framed square holes for the windows, and what looked to be a small Airstream trailer stuck up on top. Homemade architecture, what we once called ad hoc design. Chantal exemplifies the novel’s theme that even your neighbor, a person you think you know, can hide the deepest secrets, and when Chantal’s performance artist daughter Tinker arrives on the scene, things only get stranger for Wallace. All the mysteries of the novel are not solved by its conclusion, and while in the hands of another author, There Must be Some Mistake would become a dramatic murder mystery, instead Barthelme veers away from the predictable and gives us a marvelous novel that is a reflection of, and a meditation on, modern life: from Trayvon Martin, reality TV, google searches, celebrity and junk culture. Some people disliked the ending, but for this reader, the ending matched the novel’s optimistic tone while embracing the realities, the unexpected and the mysteries of life. So I’m looking forward to social security, know what I’m saying, and I run into this woman in the hardware store. She’s buying a set of wrenches, good ones, too. So she asks me a couple questions, and I act like I know from wrenches, which I oughta, and maybe I even did at one time, back in the old days, but the thing is I’m thinking sixty-one is not much different from fifty-nine, even fifty-five, but it’s night and day to fifty. Fifty you’re still alive, still a functioning cog in the system. There are parts to play, deals to make, women to bed. you can still sell yourself to the ones that remind you what pretty women look like, what god skin in, and the rest. But it goes downhill after that. Some guys keep up the pretense, but I never could. As I was reading your review, I couldn’t help but think there’s a big denouement coming here, so it’s interesting to hear this story takes a less-predictable path. I haven’t come across this author at all. Have you read anything else by Barthelme or was this your first? I love the cover and would be attracted by it, too. No I’d never read anything by this author. I’d never heard his name either, sad to say, although, I’d heard of his brother. My first questions was whether there’s a relationship with Donald Barthelme: they’re brothers, I see. By association I’d expect something interesting, and sounds like it delivers. Yes Leroy, I’ve been looking at the substantial backlist and there are many titles there that appeal to me. 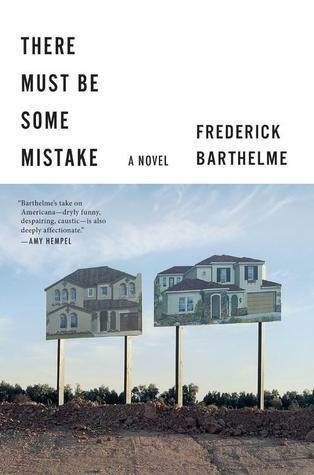 I read comments on goodreads from people saying that this was their first Barthelme and how they didn’t know what to expect. The author really takes a much different road from other books you’d read that touch on the same subjects. Wallace would be unhappy, he’d be fighting with his ex-wife. He’d be drinking too much. His daughter would be a problem. But in this novel, none of these things appear–that’s not where the dilemma/tension exists. In fact tension is remarkably absent–in spite of all the peculiar things going on. Indeed, so many people do have all kinds of things going on that few people know about. I like the light philosophical musing of the first passage that you quoted. There are a lot of good quotes here, Brian. I had to be ruthless when selecting the ones I eventually chose. Are “K-Mart Realism” and “Dirty Realism” still current? I remember laughing at those terms thirty years ago. The idea that Bobbie Ann Mason or Tobias Wolff characters are “dirty,” ugh. Although many would have shopped at K-Mart. The term needs to be updated – as you noted, this guy shops at Target. I couldn’t tell you if the term is still current or not. Usually someone in academia comes up with these things. And literary critics. I forgot them. I had never heard of the terms K-Mart Realism but find it very evocative. Just saw that my question about Donald Barthelme was answered. I know him but not his brother. I’d heard of Donald Barthelme too, and when I saw the name of the author of this book, I asked myself why it sounded familiar. I liked this very much indeed. I love the cover, it looks like a painting by Magritte.It would have attracted me too. These closed communities are a great plot device. I’m curious about the ending now. PS: Why would she call her restaurant Vélodrome? Is she a bike addict? Or has it a darker meaning? Another question: how does it compare to the one by Garnier in a gated community in the South of France? With the Garnier novel, there’s real malice in the characters and in the plot. This feels more ‘normal’ and yet it’s laced with strange incidents, accidents, murders, attacks, and weird architecture: a giant bear outside a restaurant, a virgin mary, a trailer poised on top of the velodrome restaurant. It’s fairly easy to picture the residents in the Barthleme book as the sort of people you might know. I suppose that’s where the realism comes in. Garnier’s crueler with his characters, I think. He tosses them into the gated community and let’s them have at it while exposing their fears and prejudices. Barthelme’s main character is a nice man, very optimistic, and in a way he doesn’t want to know about all the bad things happening around him.